I visited John Kerry’s and George Bush’s sites today, and I found what I feel is an interesting contrast between the two web sites. 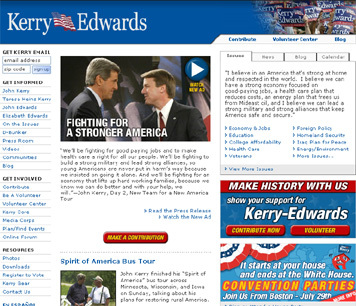 Bush’s site employs significantly more negative campaigning than Kerry’s site. I took screen snapshots of the two sites, so you can see for yourself. I am a Kerry supporter. However, I have not altered the pictures in any way. 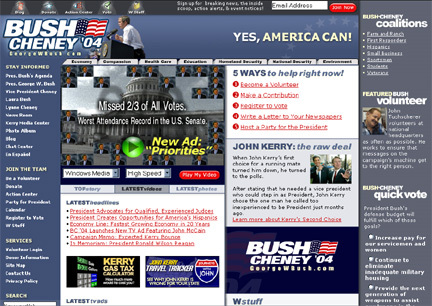 I find the amount of negative advertising on Bush’s site a little amazing, but I am also shocked by the lack of negative advertising on Kerry’s site.